In the first half of the eighteenth century, a new comic plot formula dramatizing the moral reform of a flawed protagonist emerged on the English stage. The comic reform plot was not merely a generic turn towards morality or sentimentality, Aparna Gollapudi argues, but an important social mechanism for controlling and challenging political and economic changes. 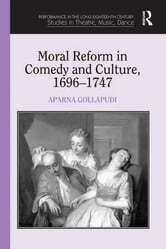 Gollapudi looks at reform comedies by dramatists such as Colley Cibber, Susanna Centlivre, Richard Steele, Charles Johnson, and Benjamin Hoadly in relation to emergent trends in finance capitalism, imperial nationalism, political factionalism, domestic ideology, and middling class-consciousness. Within the context of the cultural anxieties engendered by these developments, Gollapudi suggests, the reform comedies must be seen not as clichéd and moralistic productions but as responses to vital ideological shifts and cultural transvaluations that impose a reassuring moral schema on everyday conduct. Thoroughly researched and elegantly written, Gollapudi's study shows that reform comedies covered a range of contemporary concerns from party politics to domestic harmony and are crucial for understanding eighteenth-century literature and culture.